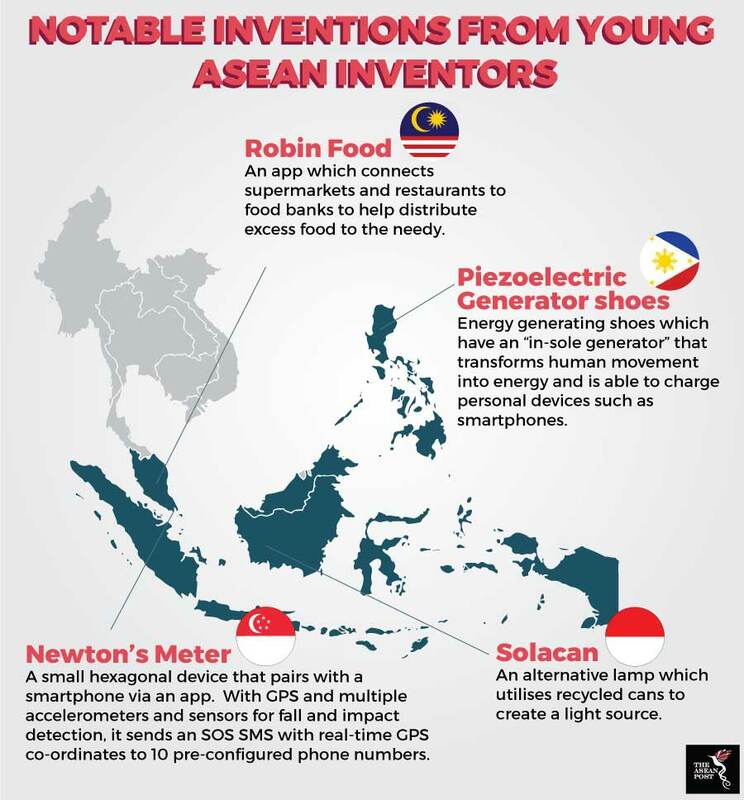 Young inventors in ASEAN are starting to break barriers and push boundaries with innovative solutions for everyday problems. From helping to prevent infant deaths to creating a source of light which does not use electricity, Southeast Asia’s young inventors are slowly coming to the forefront. In Malaysia, a pair of students were so concerned by news articles about babies dying in vehicles after being left unattended that they decided to do something about it. Joseph Chung, 16, and Thomas Brabbs, 15, designed an invention which uses a sensor to detect babies left in vehicles that are switched off and sends a signal to the caregiver’s smartphone. The invention won top prize at last year’s Sime Darby Young Innovators Challenge (SYDIC) National Championship, beating 14 other teams. In neighbouring Singapore, 16-year-old Sid Mazumdar gained fame for a personal safety device which was featured at the International Consumer and Electronics Show or CES 2019 in Las Vegas – the world’s premier consumer technology exhibition – and is touted to have industrial and military use. Called the Newton's Meter, the invention is a small hexagonal device which pairs to a smartphone. Equipped with artificial intelligence-based circuitry, microprocessors, accelerometers and sensors for fall and impact detection, it will send a SOS message with real-time GPS co-ordinates to pre-configured phone numbers when it detects a fall or impact. According to the teenager, the idea for the invention came to him after he heard a crash and later found out an unconscious motorcyclist had died after not being able to call for help. In Indonesia, four engineering students gained funding from the Indonesian Ministry of Research, Technology, and Higher Education through the Students Creativity Programme 2017 to develop an eco-friendly lamp that works without electricity. Named Solacan, the invention utilises cans and sunlight as the source of light. The light is collected in the convex light collector before being transmitted to a tube and diffused across a room. Meanwhile in the Philippines, 20-year-old Angelo Casimiro can lay claim to being the region’s most prolific young inventor after creating over 66 “do-it-yourself” (DIY) inventions as of last year – his most famous being a pair of energy generating shoes. He was only 15 when he came up with the shoes which have an “in-sole generator” and can charge personal devices like smartphones by transforming human movement into energy. Among Casimiro’s other notable inventions include a smartphone film scanner, a portable solar powerbank and a vital signs monitor. Another Filipino, Amin Hataman, was 15 when he won a bronze medal in the 2015 International Sustainable World Energy, Engineering and Environment Project (I-SWEEP) Olympiad in Houston, Texas, for inventing biodegradable plastic bags made from nata de coco, a byproduct of coconut. Maria Yzabell Angel Palma is another young inventor from the Philippines who has been in the headlines. The 19-year-old was recognised by the International Federation of Inventors’ Association (IFIA) last year after inventing an eco-friendly air-conditioner that does not require the use of a coolant. There are a several awards that recognise excellence in young inventors in the region. In Singapore, the Tan Kah Kee Young Inventors’ Award – which was first introduced by Nobel Laureate Professor C.N. Yang in 1986 – is aimed at stimulating innovation and creativity among the youth and promoting scientific and technological research in the country. In Malaysia, the Malaysian Young Inventor Exhibition (MYIE), the Science Fair for Young Children (SFYC) and the Young Inventors Challenge (YIC) have all been hailed for their role in promoting science, technology and innovation. The Leading Student Award from the National Research Council of Thailand is one of the most notable awards in the country, while in Indonesia, the International Young Inventors Award has shone attention on numerous innovative creations that help make people’s lives better. Corporate sponsorship of awards and programs such as the Sime Darby Young Innovators Challenge in Malaysia and the Bosch Young Inventors in Indonesia have helped raise young inventors’ profiles and provide grants for them to develop their inventions. Apart from proper nurturing, young inventors need to have confidence, creativity, focus and persistence. Just as important is the vision required to see an invention through from prototype stage to testing and final production. Speaking to the media during the 13th National Intellectual Property Awards last year, Malaysia’s Minister of Domestic Trade and Consumer Affairs, Saifuddin Nasution Ismail stressed the importance of good leadership in bringing inventions to market. “Innovations need to be supported by good leadership that can guarantee the model and to elevate the idea so that it can turn into something lucrative,” he said. With an increasing number of young inventors emerging from ASEAN and the rise in the adoption of technology in our lives, we can expect to see a wave of new products coming to stores near us soon.